Tchin! Happy to share with you a few pics from our first year anniversary at ‪Work’n’Share‬. 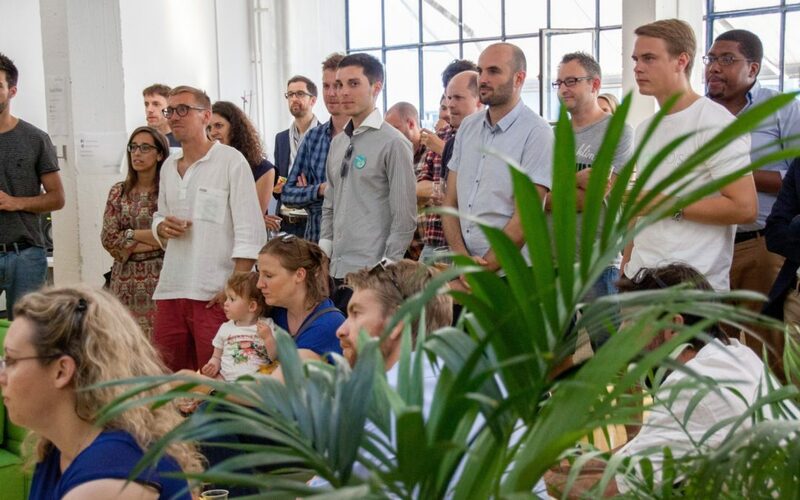 We had about 100 coworkers and guests taking part to the event on June 30, and great local entrepreneurs as partners who shared their experience and products. See you all next year for next birthday! Our community started with a team of about 10 coworkers – we all had experienced the same previous coworking space as “users” and knew what we liked and what we wanted to do by ourselves differently. In others words, we had a common vision for our new community and space. As founders, we were 7 experienced entrepreneurs and free-lancers, and went for an Association legal status, which better mitigates individual risk and responsibility. It could have limited our access to landlords in our quest for an available space, but we created a trustful relationship with the owner of our building. He believes in the concept of coworking as a way to energize and adds value to the space, but also as a great stimulation for entrepreneurial relationships. On this healthy basis, we co-developed a business plan that gives fair benefits to the three parties: coworkers, association and owner. Arriving one year ago, we sat down in a great, luminous space of 300 m2, 1mn walk away from Leman lake in Lausanne…. But empty at that time! Arthur, active in wood construction, sourced some large tables as first desks for all of us. And we secured a partnership with Uniquement Vôtre, design furniture shop in Lausanne. Step by step, we built a smart, flexible, working-friendly environment. Next step for us is to build more, better phone booths! Speaking about the most important part, our coworkers community, would be a good detailed story for another time: in-house and hosted business events, monthly “Work’n’Lunch”, our “makers-day” Work’n’Thon, Skiing days, yoga classes are just some examples of the great community spirit that makes Work’n’Share ‘s culture and attractiveness. Sylvie is the co-founder of Work’n’Share in Lausanne-Ouchy, and the President of the Association running the community and space. She has been running her own marketing and communications business, antipod.ch, for 12 years.